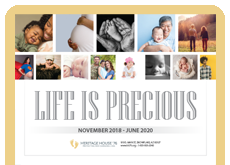 Description: The National Silent No More Awareness Campaign wants to share the truth with the general public about the negative consequences of abortion for women. The Silent No More Awareness Campaign invites women who want to help get the truth out to display these products. 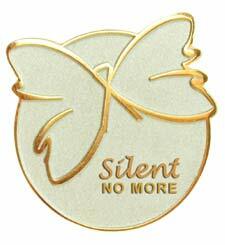 These Beautiful Two Tone Silent No More Awareness Lapel Pin will help carry that message. For more information see the Silent No More website at www.silentnomoreawareness.org. This pin is very nice. I wear mine on my coat. It symbolizes my own personal experience, and I am in hopes that someone may see this pin and want to talk about their own experience. These are beautiful and well made. A great way to start a conversation or to identify counselors at an event. The only reason I gave them a four instead of a five, is that they are a little heavy for pinning to a blouse. They are better suited to pin to a lanyard, badge or purse. Overall, I love them though.